We're here to help you succeed in your research. The Reference Desk is in the Robert L. Oakley Reading Room of the Williams Library on the main floor. During the academic year, this desk is open from Monday - Thursday 9:00am to 8:00pm; Friday 9:00am to 5:00pm; and on weekends 12:00pm to 6:00pm. During the summer and school breaks, there is no evening or weekend reference service. 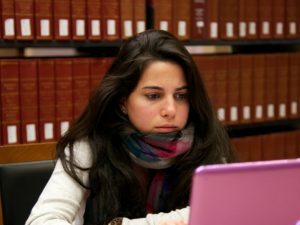 We offer research assistance, using chat software to connect you to one of our librarians -- no matter where you are. 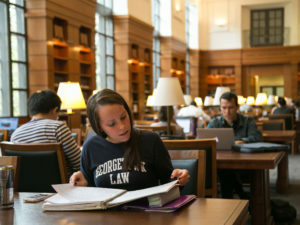 This service is available to Georgetown students, faculty, and staff, who need help with legal research whenever the Reference Desk is open. 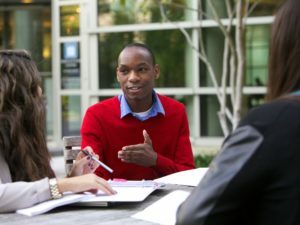 Georgetown Law students can schedule an individual research consultation with a reference librarian for assistance with papers or other research projects. Please note that we prepare for these meetings and need at least 1-2 days to prepare for your topic.